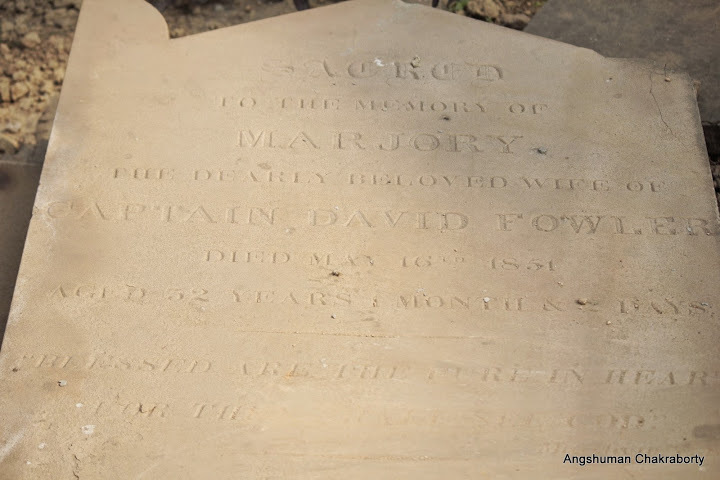 Sacred / to the memory of/ MARJORY/ the dearly beloved wife of/ Captain David Fowler/ Died May 16th 1851/ Aged 52 years 1 month & 7 Days/ ___/ Blessed are the pure in heart, for they shall see God. “Birth-- FOWLER-- At Elie, Fifeshire, on the 22d inst., the wife of Captain David FOWLER, late of the Steamer Thunder, of a daughter.” -- Caledonian Mercury, Edinburgh, 30 Mar 1864 Apparently a connection with the Thunder was worthy of note to the folks back home. David Fowler had also commanded the Catherine Apcar and the Armenian, both Apcar ships. Matthew 5:8: Blessed are the pure in heart, for they shall see God.